Download Calendar for iPhone, Outlook, �Apple Calendar, etc. Former Knights' Broadcasters Take Next Career Step. The Corvallis Knights alums in the broadcasting business took another step in their quest for a major league job this summer. USC graduate Jason Schwartz, who co-anchored with Mike Parker during the 2010 season, finished his third season with the Lancaster JetHawks, Houston's affiliate in the Class A California League. Virginia Tech alum Kevin Burke, who broadcast every game in 2012, spent the summer with the Traverse City Beach Bums of the independent Frontier League, near Lake Michigan in the western part of that state's lower peninsula. The defending-champion JetHawks beat Visalia in the finals of the California League playoffs to repeat; the best-of-5 series concluded this week. It's the sixth straight year that Schwartz, who worked for the Wenatchee AppleSox in 2009 and the Tri-City Dust Devils in 2011, followed a playoff team. "I've been fortunate to only call winning baseball since leaving the Knights," Schwartz said. "In my six seasons as a broadcaster, I've had six playoff teams, five division winners and three titles." Schwartz has also seen many ex-Knights, and other WCL alums, in his three seasons in the California League, one of two advanced-A circuits in affiliated baseball. "Jake Rodriguez (2010) played for us briefly at the start of the season" before being moved to another team for increased playing time, Schwartz said. "I've seen Ryan Gorton (2011) and Matt Duffy (2010)," at Stockton in 2014 and at San Jose in 2013, respectively. Duffy is now in the majors, with the San Francisco Giants. Schwartz said he has enjoyed his stint with the JetHawks and would be happy to come back for a fourth year. But he also wouldn't be opposed to a change of scenery, or a change in broadcasting medium. "I feel ready for and open to the next challenge, whatever that may be," he said. "Hopefully that's either at a more advanced level of baseball, or at a TV job with a network. "This offseason I will travel a bit - including at least one trip to Oregon now that my sister will be starting her freshman year at Oregon - and try to recover from the long baseball season. "I'll do some college basketball as well. Last season I called games for the USC women and the Long Beach State men." His biggest 2014 highlight may have been meeting Hall of Famer Vin Scully of the Los Angeles Dodgers, a broadcasting legend who was staple in Schwartz's household as a youth in Los Angeles. "Meeting Vin was beyond special," Schwartz said. "He was incredibly kind and showed a sincere interest in my career and my success. "When I first started, everything I knew about broadcasting, I knew just from growing up listening to him. I'm not even sure I would have wanted to get into this business had it not been for that influence." 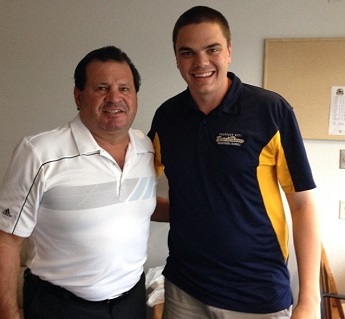 Burke (pictured with Team USA hockey legend Mike Eruzione) spent 2013 as an intern with the Pensacola (Fla.) Blue Wahoos, Cincinnati's affiliate in the double-A Southern League. He was the No. 2 broadcaster, primarily at home games; wrote press notes, feature stories, and maintained their social media accounts. This season he returned to the broadcast booth full-time, and got to see a different side of the business. "Working in independent baseball provided a unique perspective," he said. "Not only were players trying to further their careers, but the coaches were able to focus on winning without pressure from a parent organization." Burke is also open to new challenges as he advances in his professional career. "I'm looking to take the next step and find a full-time position, whether that be in affiliated baseball or with a college," he said. "This fall/winter I'll (return) to High Point (N. C.) University as the women's basketball broadcaster and as a fill-in for men's broadcasts. "I'll also be working in the sports information department assisting with anything and everything that's needed." Site Hosted by Partnered Solutions IT.